The book is available from most online book shops. Click on the links below. A non-fiction book about corruption in the Australian Government, Judiciary and Federal Police. Prima Facie cases against a number of judicial officers for breaching section 34 of the 1914 Crimes Act. The Attorney General, Robert McClelland, trying to cover up the corruption and caught out lying about referring the corruption to the Federal Police. 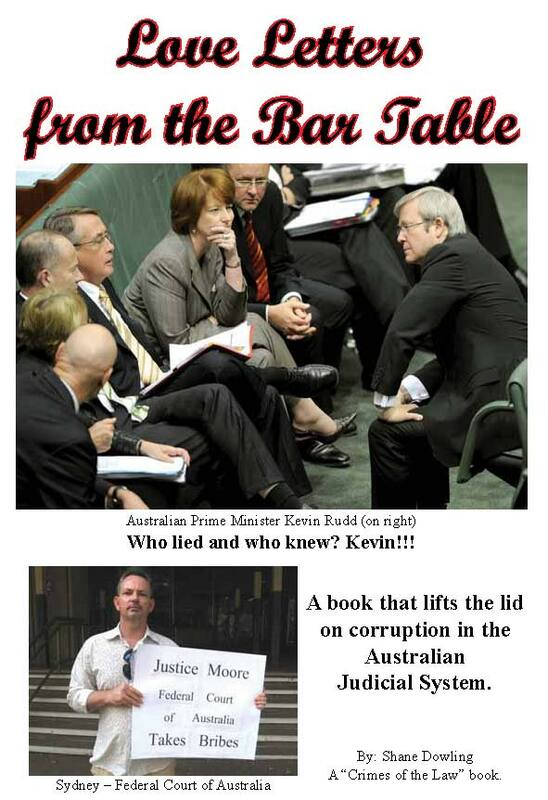 The former Prime Minister Kevin Rudd turning a blind eye to the corruption. The current directors of Fairfax Media being in contempt of court. A current judge having a sexual relationship with one of the respondents while the judge was hearing the matter. Transcript evidence of a judicial officer lying while on the bench in relation to having a personal interest in the matters. When I started asking to many questions he quickly transferred the matters to the Federal Court. The fraudulent costs bill sent to the author by Freehills Lawyers on behalf of Fairfax Media which showed criminal conduct and fraud etc. So much so that they could never enforce the costs. The criminal history of a judicial officer which includes price fixing and bribing a witness. The former Commonwealth Ombudsman, Professor John McMillan, has openly stated in an ABC Four Corners interview (October 2008) that the Australian Federal Police do not want to know about corruption in their own department. He said he was also told this directly by senior Australian Federal Police. This in itself says there needs to be a Royal Commission. It is worth noting that the Federal Police and the Federal Courts are all part of the Attorney Generals Department. Just for the record on the front cover above there is a picture of the author holding a sign saying “Justice Moore Federal Court of Australia takes bribes”. The photo and others like it were tendered as part of an affidavit in court before Justice Moore. The book has further information on the history of the photos. Some of the topics the book raises and/or deals with are: judicial bias – judicial corruption – bribes – perceived bias – actual bias – breaching the Barrister Rules – breaching the Solicitor Rules – lack of ethics – abusing procedural fairness – abuse of processes – delaying tactics – over charging – attempted fraud – criminal conduct – attempting to pervert the course of justice – fabricating evidence – dereliction of duty – shredding of evidence - personal interest. To read the full review on Phillip Taylor’s Flickr book review site click on the link below.